Objective: This study aims to review and to evaluate the ocular effects of blunt trauma due to injury from airsoft gun pellets over an 8-year period. Materials and Methods: We conducted a retrospective study based on the files of 92 patients who suffered ocular injury from airsoft guns and were admitted to one teaching hospital in Northeastern India, during an 8-year period. Results: A total of 92 eyes in 92 patients were examined. A total of 79 male and 13 female patients were affected. The mean age was 12.56 years (range 5–28 years). Mean follow-up time was 12.27 days (range 1–120 days). On initial examination, we found: hyphema (n = 79), corneal abrasion (n = 50), retinal edema (n = 9), subconjunctival hemorrhage (n = 29), lid contusion (n = 14), iris dialysis (n = 19), vitreous hemorrhage (n = 6), cataract (n = 9), and globe rupture (n = 2). Four patients had the pellet lodged in the upper fornix that required removal under topical anesthesia The final visual acuity was 6/6 in 62 patients, 6/9 in 11 patients, 6/12 in 7 patients, 6/24 in 2 patients, 6/60 in 3 patients, and finger counting in two cases who developed corneal scarring. Conclusion: Airsoft guns can cause many serious injuries of the eye some of which even required operative intervention. The long-term morbidity from some of these injuries is significant owing to the risks of permanent corneal scarring, cataract, and glaucoma. Eye care professionals and parents are urged to understand the potential damage that can result from such injuries and help spread awareness on the need to wear adequate protection when involved in this activity. A good proportion of eye injuries in the Northeastern parts of India results from airsoft guns misused by children and adolescents as toys. Airsoft guns are 1:1 scale replicas of actual firearms. Compared with air gun and paintball projectile, a 0.2-g airsoft plastic projectile would not be expected to cause much damage.,, There are only few reports in the English literature that document the risk of ocular damage caused by airsoft guns.,,, We would like to document the incidence of airsoft gun ocular injury in this Northeastern border state of India, compare our findings with those of previous studies, describe the resulting lesions, and increase the awareness of the potential hazard posed by the use of airsoft toy guns. A retrospective study of the clinical records of 329 ocular injuries cases who attended the ophthalmology department of a tertiary teaching hospital in Northeast India over an 8-year period was carried out. Of the 329 cases of ocular injuries who were examined and treated at the institute's eye department between April 2010 and March 2018, 92 were found to have been caused by pellets fired from airsoft toy guns. Approval for the study was obtained from the Institutional Ethical Committee. We registered the patients' age, gender, symptoms, ocular findings, and use of eye protection. Initial and final follow-up examinations included visual acuity, slit-lamp biomicroscopy, intraocular pressure measurement, and indirect ophthalmoscopy. Treatment profile and follow-up time were also documented. The terms used in the description of the ocular injuries conform to the recommendations of the United States Eye Injury Registry and the International Society of Ocular Trauma. Of the 329 cases of ocular injuries who were examined and treated at the institute's eye department between April 2010 and March 2018, 92 were found to have been caused by pellets fired from airsoft toy guns, accounting for 27.9% of all ocular injury cases. A total of 23 patients required admission in the ward, and the rest were treated as outpatients. The mean hospital stay for the hospitalized patients was 3.3 days. Airsoft gun injuries occurred in 79 male and 13 female patients. Only one eye was affected in each patient. Mean follow-up time was 12.27 days (range 1–120 days). The mean age of the participants was 12.56 years (range 5–28 years). Only seven patients in our series were over 18 years of age; the majority were 10–15 years old. None of the patients were reported to have been wearing eye protection (protective glasses) at the time of injury. Forty-nine (53.2%) of the patients were hit in the right eye. Pain was the presenting symptom in 75 (81.5%) of the patients, while 61 (66.3%) reported vision impairment and 8 (8.6%) patients suffered from nausea and vomiting. The final visual acuity was 6/6 in 62 patients, 6/9 in 11 patients, 6/12 in 7 patients, 6/24 in 2 patients, 6/60 in 3 patients, and finger counting in two cases who developed corneal scarring. Three cases with corneal staining and two cases with aphakia following initial treatment whose vision was 6/24 or less were lost to follow-up. A total of 18 of the cases required some kind of surgical intervention while the rest were treated conservatively. Nearly 79 (85.8%) cases presented with hyphema out of which one case of moderate hyphema and six cases of total hyphema required paracentesis. Nine (9.7%) cases developed traumatic cataract of which three cases had ruptured traumatic cataract, two cases had subluxated lens, and four cases presented with intact capsule. The ruptured traumatic cataract cases were subjected to urgent irrigation and aspiration without intraocular lens (IOL) implantation while intracapsular cataract extraction without IOL was performed in two cases with subluxated lens. Four cases of cataract with intact capsule received small incision cataract surgery with IOL implantation at a later period ranging from 2 to 8 weeks after the initial injury. Emergency repair surgery was performed on two cases who presented with globe rupture who had a poor visual outcome owing to corneal scarring. Vitreous hemorrhage was seen in 6 cases (6.5%) and retinal edema in 9 (9.7%) cases, all of which improved with conservative treatment. In four patients, the pellet was found lodged in the upper fornix that required removal under topical anesthesia. 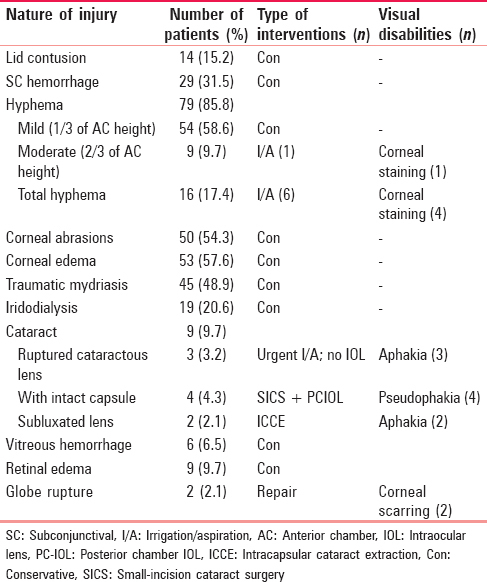 The ocular findings are summarized in [Table 1]. Airsoft guns are replicas of actual guns designed to shoot nonmetallic spherical projectiles often colloquially (and incorrectly) referred to as “BBs”, which are typically made of (but not limited to) plastic or biodegradable resin materials. The airsoft pellets weigh 0.12–0.43 g. Airsoft guns shoot the pellets at velocities from 30 m/s (98 ft./s) for a low-end spring pistol, to 200 m/s (660 ft./s) for heavily upgraded customized sniper rifles. Most nonupgraded airsoft guns are in the middle, producing velocities from 90 m/s (300 ft./s) to 120 m/s (390 ft./s). These toys have the potential to cause serious eye injuries. In almost all the cases, patients experienced hyphema or microhyphema as a result of blunt trauma. This finding is consistent with other studies., Traumatic cataract, globe perforation, corneal abrasion, traumatic mydriasis, lid contusion, iris dialysis, subconjunctival hemorrhage, vitreous hemorrhage, and retinal edema are other injuries. Other firearms are also known to cause ocular injury. Air guns (BB guns), which use 4.5-mm lead or steel pellets, have a speed of approximately 140 m / second and a range of 300 m, can result in eye and life-threatening injury., Paintball pellets, 17-mm gelatin projectiles filled with paint, weigh approximately 3.2 g, have a (muzzle velocity up to 130 m / second, and a range of approximately 150 m and are known to result in globe-damaging injury for which some patients require enucleation. Compared with the latter two weapons, the lightweight airsoft gun pellet might be considered less harmful; however, the risks of significant ocular injury are very real. This is evident from the fact that nine (9.7%) cases presented with or developed traumatic cataract and two cases pres ented with globe perforation, with a poor final visual outcome in at least 7 patients. More than 80% of the cases in this study presented with severe pain and hyphema. Although the initial visual impairment in the vitreous hemorrhage and retinal edema cases improved after conservative treatment, they can result in persistent retinal dysfunction. For a child, airsoft pellet-related ocular injuries represent a traumatizing experience with a long-term risk of glaucoma, and cataract., We found no patients with retinal tears or retinal detachment in our series. Most of the patients recovered completely after a few days; however, a significant number of these patients suffered long-term visual impairment. Ocular traumas from airsoft gun pellets represent a significant share of all severe ocular trauma registered in our eye department in an 8-year period. A total of 92% of the airsoft injury patients in our series were under 18 years of age. The patients suffered acute ocular injuries including ruptured globe and increased risk of traumatic cataract, corneal discoloration, and lasting pupil dysfunction, as well as retinal dysfunction from Berlin's edema. In our series, children as young as 5 years of age suffered from eye injury due to airsoft projectiles, which highlights the need to restrict the availability of these weapons to children. All patients hit by airsoft pellets should be referred to an ophthalmologist for further investigation. Airsoft guns are regarded as toys; however, they have the potential to cause severe eye injury. Some upgraded models propel the pellets faster, with potential for even more severe injury. Hence, safety goggles should be included with the guns and wearing them should be mandatory while playing. Age and sales restrictions must be followed. Drummond J, Kielar RA. Perforating ocular shotgun injuries: Relationship of ocular findings to pellet ballistics. South Med J 1976;69:1066-8. Fineman MS, Fischer DH, Jeffers JB, Buerger DG, Repke C. Changing trends in paintball sport-related ocular injuries. Arch Ophthalmol 2000;118:60-4. Harris W, Luterman A, Curreri PW. BB and pellet guns – Toys or deadly weapons? J Trauma 1983;23:566-9. Endo S, Ishida N, Yamaguchi T. The BB gun is equivalent to the airsoft gun in the Japanese literature. Arch Ophthalmol 2000;118:732. Endo S, Ishida N, Yamaguchi T. Tear in the trabecular meshwork caused by an airsoft gun. Am J Ophthalmol 2001;131:656-7. Fleischhauer JC, Goldblum D, Frueh BE, Koerner F. Ocular injuries caused by airsoft guns. Arch Ophthalmol 1999;117:1437-9. Sangeeta Devi N, Bhabanisana RK, Vidyarani RK, Kaminibabu Singh K, Beema H. A retrospective study of 22 consecutive cases of ocular injuries due to airsoft gun pellets during a one-year period. J Med Soc 2011;25:67-70. Kuhn F, Morris R, Witherspoon CD, Mester V. The Birmingham eye trauma terminology system (BETT). J Fr Ophtalmol 2004;27:206-10. Shazly TA, Al-Hussaini AK. Pediatric ocular injuries from airsoft toy guns. J Pediatr Ophthalmol Strabismus 2012;49:54-7. Wikipedia. Airsoft Guns. Available from: https://www.en.wikipedia.org/wiki/Airsoft_gun. [Last accessed on 2018 Sep 29]. Shanon A, Feldman W. Serious childhood injuries caused by air guns. CMAJ 1991;144:723-5. Shuttleworth GN, Galloway PH. Ocular air-gun injury: 19 cases. J R Soc Med 2001;94:396-9. Thach AB, Ward TP, Hollifield RD, Dugel PU, Sipperley JO, Marx JL, et al. Ocular injuries from paintball pellets. Ophthalmology 1999;106:533-7. Kaufman JH, Tolpin DW. Glaucoma after traumatic angle recession. A ten-year prospective study. Am J Ophthalmol 1974;78:648-54. MacCumber M. Management of Ocular Injuries and Emergencies. Hagerstown, MD: Lippincott-Raven; 1997. p. 229.